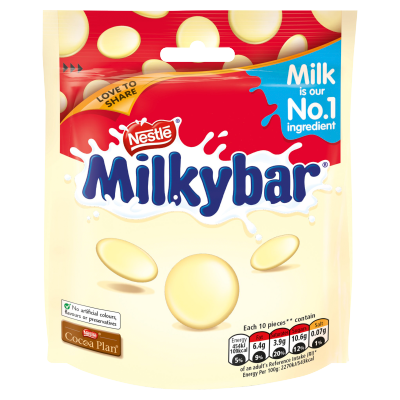 Milkybar® is the UK and Ireland's No.1 white chocolate brand thanks to its delicious taste. Check out our range below. 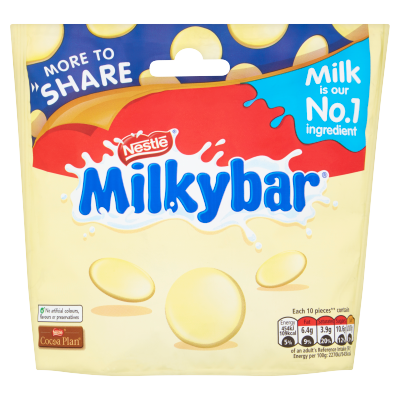 We love milk at Milkybar®, which is why we've added even more of it to our famous white chocolate recipe. It's simple stuff! We've dialled the fun up even more by teaming up with Smarties®! 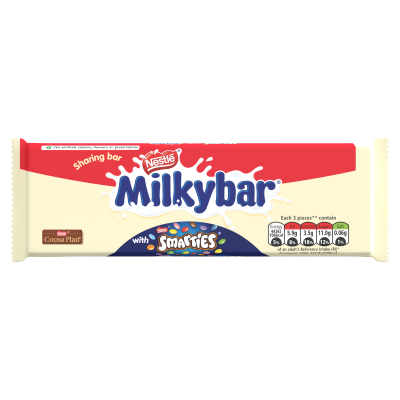 Our Milkybar® and Smarties® sharing block has the creamy-tasting Milkybar® white chocolate that you love, with the fun, colourful crunch of Smarties! Milkybar® and Smarties® come together to make a fun sharing block of deliciously creamy-tasting milk chocolate studded with the colourful crunch of Smarties® chocolates! Perfect for moments of simple fun. Made with natural flavourings, it's good to share! 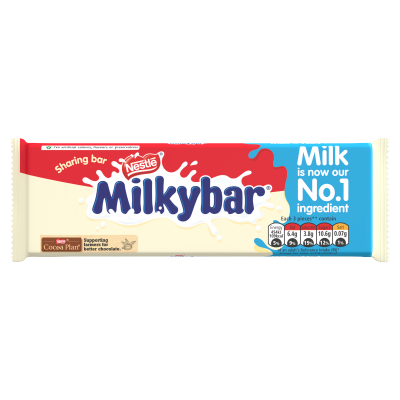 Milkybar® was created in 1937, when Nestlé almost exclusively manufactured milk products. 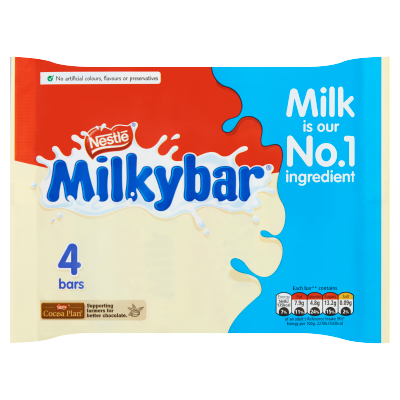 The recipe is different today, but at Milkybar® we still love milk - you only have to look at our simple white chocolate recipe to see how much! 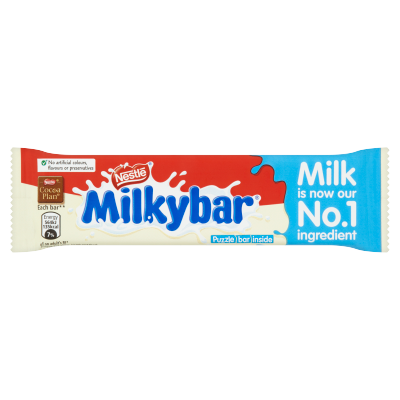 Enjoy the delicious taste of Milkybar® in bars, blocks and buttons. Enjoying chocolate as part of a varied, balanced diet and a healthy lifestyle is one of life's little pleasures. Milkybar® is part of the Nestlé Cocoa Plan, which works with UTZ to ensure a better future for cocoa farmers and even better chocolate for you. Find out more at www.nestlecocoaplan.com. 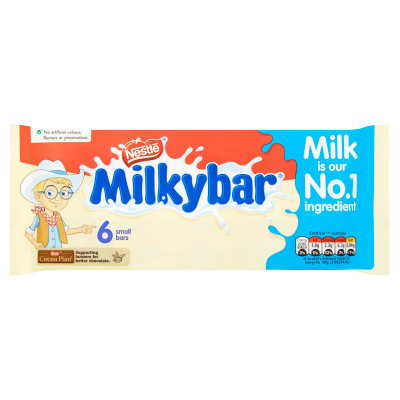 Milkybar® is one of the UK and Ireland's best-loved brands. Launched in 1936, it is the No.1 white chocolate brand, enjoyed by both kids and adults alike. 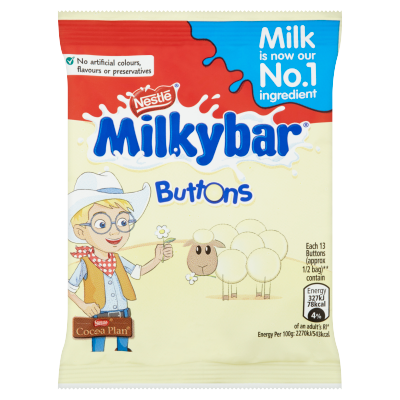 We're excited to share the latest Milkybar® products and news with you. You must be 16 years or over to enter, so please pop your age in the box for us to verify.